St. Paul Lutheran School raises over $10,500 to benefit Melaina's Magical Playland! 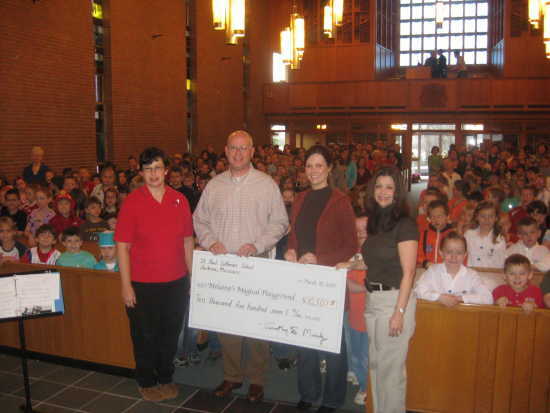 St. Paul Lutheran School presents Andrea Cunningham with a check for $10,507.18 to benefit Melaina's Magical Playland. Pictured from left to right are Lisa White (kindergarten teacher), State Representative Scott A. Lipke, Andrea Cunningham, and Jennifer Icaza-Gast (founder/CEO of Student Santas). St. Paul Lutheran School's preschoolers through 3rd graders have raised over $10,500 to benefit Melaina's Magical Playland! Beginning in mid-October, 2009, these students began saving coins in a special coin box. As their boxes became full, they emptied them in a special container at the school. In addition, on Monday, March 8th, as part of a special service project during National Lutheran Schools Week (March 7-13), this same group of 200+ students collected pledges and participated in a walk-a-thon that was held at the Osage Community Centre. The walk-a-thon was hosted by the Student Santas. On Wednesday, March 10th, St. Paul Lutheran School presented Andrea Cunningham with a check in the amount of $10,507.18 to benefit Melaina's Magical Playland. Melaina's Magical Playland will be a playground in which children of all abilities can play side-by-side. Three-year-old Melaina Cunningham passed away in March, 2009 from complications of nemaline rod myopathy, which is related to muscular dystrophy. Her parents, Jeff and Andrea Cunningham, recognized the need for an all-inclusive/accessible playground in this area and are leading the efforts to build this playground in Melaina's memory. Donations may be sent to: Melaina Cunningham and Friends Park Fund, P.O. Box 211, Cape Girardeau, MO 63702.